Bowie released his last album last Friday. 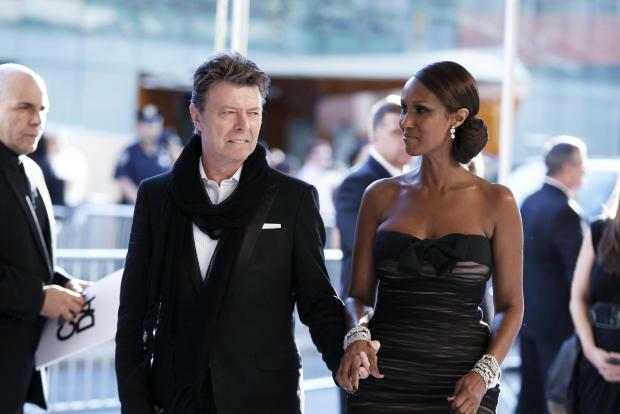 File photo of singer Bowie arriving with his wife Iman. Stars from the world of showbiz and entertainment have summoned the words of David Bowie to pay tribute to the rock star. The 69-year-old - known for hits such as Changes, Ashes To Ashes and Starman - left a legacy created by pioneering musicianship and ground-breaking lyrics dating back almost half a century. He died last night after suffering from cancer for 18 months. Bowie released his latest album, Blackstar, just three days ago in what appeared an omen. Born and named David Robert Jones, the rock ’n’ roll celebrity underwent a whirlwind of transformations. But it was under the name David Bowie that he would be recognised for his musical talent and this would lead him to claim his first ever award... in Malta. 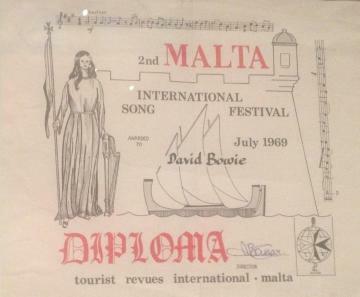 It was in Malta, at the Hilton, in 1969, that Bowie was singled out for best-produced record for the Malta International Song Festival. It was also the first accolade he received in a lifetime of awards. Australian actor Russell Crowe, referencing one of Bowie's better known singles which featured on covers album Pin Ups 1973, wrote: "RIP David. I loved your music. I loved you. One of the greatest performance artists to have ever lived. #sorrow"
Rock guitarist Joel Madden, quoting Changes, simply added: "Turn and face the strange." Actor Mark Ruffalo wrote: "Rip Father of all us freaks. Sad sad day. Love always Legendary singer David Bowie dies at 69." While comedian and writer Eddie Izzard said: "Very sad to hear about the death of David Bowie but through his music he will live forever." Archbishop of Canterbury Justin Welby told the BBC Radio 4 Today programme he became a Bowie fan during the singer's early rise to prominence. He said: "I'm very, very saddened to hear of his death. "I remember sitting listening to his songs endlessly in the '70s particularly and always really relishing what he was, what he did, the impact he had. And British Prime Minister David Cameron, whose musical tastes are well documented, also offered his condolences. He said: "I grew up listening to and watching the pop genius David Bowie. He was a master of re-invention, who kept getting it right. A huge loss." Paying tribute to the singer on Twitter, comedian and actor Ricky Gervais, who convinced his long-time idol to star as himself - and ridicule Gervais - in an episode of 2006 sitcom Extras, wrote simply: "I just lost a hero. RIP David Bowie." He also uploaded an image of himself from the late 1990s dressed as Bowie's famous alter-ego Ziggy Stardust, taken from the comedian's 30-minute Comedy Lab episode in which Gervais played the part of a Bowie impersonator. Radio DJ Fearne Cotton wrote on Instagram: "Devastated. There will only ever be one David Bowie. "A pioneer, a maverick and a visionary. I've been so inspired by him and his intent on doing what he wants without thought of judgment and views of others. RIP to one of the last icons." Former Radio 1 DJ Tony Blackburn wrote: "So sorry to hear of the death of David Bowie at only 69. A man who really was a giant in the world of music R.I.P." BBC 6 Music's Lauren Laverne said: "Still in shock, this is a huge loss to everyone who loves music. We'll be on air at 10. Tell us what you want to hear and we'll do our best." Rapper Kanye West said: "David Bowie was one of my most important inspirations, so fearless, so creative, he gave us magic for a lifetime." Television presenter Phillip Schofield said: "We just lost one of the coolest guys on the planet. RIP David Bowie." Politicians, led by Mr Cameron, also shared their memories of the Heroes singer. Culture Secretary John Whittingdale wrote: "Deeply saddened to learn of the loss of David Bowie: a unique and extraordinary talent whose influence was felt around the world." Business Secretary Savid Javid said: "David Bowie brought great joy to me and many millions across the world. An iconic British artist that will be sorely missed. RIP." London Mayor Boris Johnson said: "Terrible news to hear Brixton-born David Bowie has died. No-one in our age has better deserved to be called a genius." Chancellor George Osborne said: "So sad to hear about the great David Bowie - his music was a backdrop to my life. An incredible icon of British creativity who made us proud." Former Number 10 spin doctor Alastair Campbell tweeted a memory about Bowie and a former Prime Minister. He said: "Only two times I saw Tony Blair star struck were when he met David Bowie at Brits and Barbra Streisand in a make up room. Star goes out RIP." Bowie collaborator Rick Wakeman credited the star as having been the greatest influence on his career. He wrote on Twitter: "As I'm sure you can imagine I'm gutted hearing of David's passing. He was the biggest influence & encouragement I could ever have wished for." In an interview with the Telegraph in 2014, Wakeman said Bowie had advised him to "be your own man and don't listen to people who don't know a hatchet from a crotchet and try to fulfil their own ideas through you because they haven't got any". 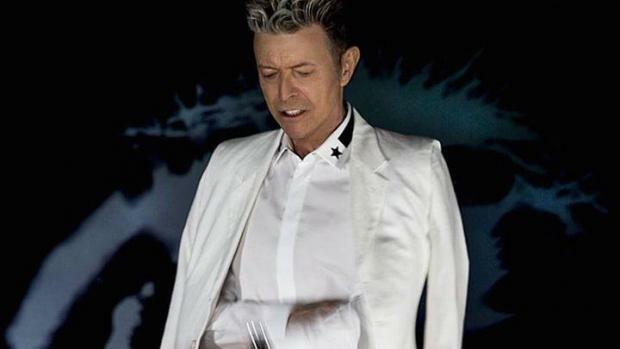 American musician and performer Pharrell Williams, a long-time Bowie fan, described the late performer as "a true innovator, a true creative", while Leicester rockers Kasabian described themselves as "devastated". Actor Joseph Gordon-Levitt, quoting Bowie's Eight Line Poem from 1971's Hunky Dory, added: "But the key to the city is in the sun that pins the branches to the sky..."
Comic writer David Baddiel wrote on Twitter: "Not just upset by Bowie's death but disorientated: like I've woken up and the world is out of joint. I think I assumed he was immortal." Britain's other "star man", astronaut Tim Peake, tweeted from the International Space Station: "Saddened to hear David Bowie has lost his battle with cancer - his music was an inspiration to many." Labour leader Jeremy Corbyn told the BBC Radio 4 Today programme that Bowie was a "great musician, great entertainer". "As soon as I heard of his death, very, very sad, Life On Mars comes flowing back into my mind. Wonderful song, wonderful guy." One Direction singer Louis Tomlinson described Bowie as "a music legend". Rock pioneers Pixies tweeted an undated picture featuring the late musician sitting around a sofa joined by the likes of Foo Fighters founder Dave Grohl, Smashing Pumpkins frontman Billy Corgan and The Cure's Robert Smith. The caption read: "A true Inspiration". British actor Simon Pegg wrote: "If you're sad today, just remember the world is over 4 billion years old and you somehow managed to exist at the same time as David Bowie." Stand-up comedian John Bishop added: "Very sad news about David Bowie. Few people leave the world a better place and inspire so many people in so many ways." Scottish singer-songwriter Midge Ure paid tribute on ITV's Good Morning Britain, saying he and other musicians had seen Bowie as a role model. He said: "I think if you spoke to any musician who has been around in the last 30, 40 years, we all have benchmarks that we try and emulate, we all have benchmarks that we put our feeble efforts next to, and somewhere along the line you do think, 'well, what would David Bowie do here?'. "Because he wasn't just a brilliant songwriter and an amazing creator, he excelled at everything. He gave us the point to run towards, we are all still trying to run towards that, everyone. "We are all swimming in his wake, so I don't think you could top on creativity, and consistent creativity, I don't think you could top, anyone could top, David Bowie in the UK musical history." On Bowie's illness, Ure said: "I think people within the industry had heard rumours about cancer, we'd heard rumours about him not being well. "We all knew something was amiss but this is more than just turning on your phone in the morning or turning on the television and finding out that another celebrity has passed on. "I'm standing here, my hands are shaking, I feel as though I've lost something, I've lost something incredibly important today."